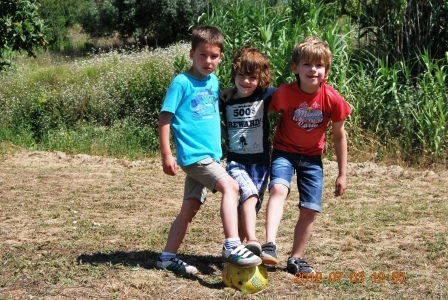 Quinta Laranja in Portugal is a child friendly collection of cottages that has plenty to offer for a holiday with both small as older kids. Did you know that our holiday park is listed as a `real child friendly family accommodation´ in a Dutch guide book called “Kidsproof holidays in Southern Europe”? At the Silver Coast (Costa de Prata) there are plenty of things to do for kids but the adventure lurks even here at our holiday park. Did you know that our holiday park is listed as a `real child friendly family accommodation´ in a Dutch guide book called “Kidsproof holidays in Southern Europe”? The biggest fun is water fun. This is why our collection of cottages and glamping has a nice and spacious swimming pool for adults and bigger kids and a separate kiddie pool for toddlers. Both swimming pools are entirely fenced. The kids can completely let themselves go in our playground: baking sand pies, playing shopkeeper, swinging or sliding down the slide. The parents can enjoy their playing kids from one of the sun loungers or lazy chairs! And did you know there are several other big playgrounds in the area of our holiday park at the Silver Coast? Besides entertaining themselves in the swimming pool, the older kids and teenagers can also jump on the trampoline, play football and explore the other possibilities on our property. 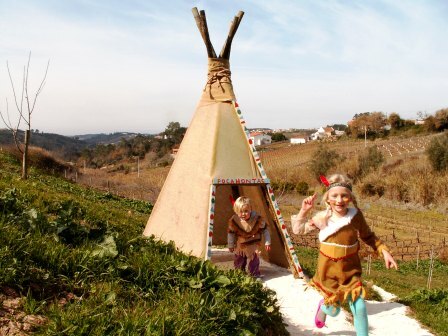 On our 6500 m2 kids can run around, play and exercise: build a hut, dress up like Indians in the Indian village or play a game of football on the football pitch. On our terrain they will meet our friendly cat Nina and our 4 sheep that can all be petted. And maybe your children would like to help feeding them. Or how about a game of Petanque with the whole family? Our whole property is fenced and completely car free. For children we have set out a special walking trail with picture puzzle. And did you know there are all kinds of animals to be spotted on and around our property? If your children can spot them during their holiday, a small surprise will be waiting! When it comes to beach life there is plenty of choice on the Costa da Prata, even with kids. São Martinho do Porto and Foz do Arelho are very suitable for smaller children. These beaches hardly have any waves so provide safe swimming. Besides at the beach of Salir do Porto the kids , and parents alike, can run down the high sand dunes! Would you would like something different, we can point you to one of our favorite spots at a wonderful little river with crystal clear waters where swimming is great too. Older kids and teenagers usually love to swim, jump and surf in the waves. And that´s exactly what the Silver Coast is also famous for! Just read on. Most children as well as teenagers and adults really enjoy (learning) to surf and body board. The possibilities for these watersports are huge in the Costa de Prata with famous surfing spots like Foz do Arelho, Peniche and Nazaré around the corner. In the holiday period we organize (when numbers suffice) a weekly surfing clinic on the beach of Baleal. Have a great surfing session together with the other guests, under the professional guidance of a surfing school. Kids from about 6 years of age (or sometimes 5) can (depending on the child) already participate and usually love to share this experience with their parents and friends from our holiday park. Since we organize these surfing sessions we have uploaded many nice pictures on the Quinta Laranja facebook page. Have a look if you think this might be something for you! At the nearby Óbidos Lagoon in Foz do Arelho you can rent any gear and materials you need for windsurfing, kitesurfing, sailing and kayaking too. All really pleasant activities for the whole family!